Many Americans will say that stuff is “The best in the world…” or, at least, many Americans I know (read: my Mother used to say that a lot, as in “Indiana strawberries are the best in the world!” and “Indiana corn is the best in the world!” – but then, Mom was the Queen of the Grand Statement, a trait she shared generously with me). As Mom didn’t travel the globe, these declarations were rubbish. Though loyal. The latter Mom very, very much was (for example, we could not wear red growing up because we are a Boilermaker family and red is an IU colour – I am not joking about that, Mom disallowed red with a vigour that was a little scary, but, I digress). 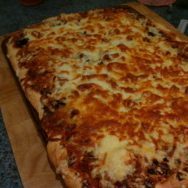 However, when I say Marky Mark’s (my ex-husband and, by the way, only my sister, her family and my brother are allowed to call him that and he still does not like it (though that does not stop us)) homemade pizza is the best in the world, I do believe I might be right. His pizza absolutely rocks! He is a master pizza maker. Everyone who’s tasted it, and there are a lot of everyone’s, say the same. His pizza is the bomb. Therefore, the time I suggested that we should maybe deviate from his usual masterpiece, he was more than a little sceptical. But I talked him into it and after tasting my creation, even Mark, who’s pretty proud of his pizza, said it was awesome. This recipe isn’t a stunning concoction – in fact, in some incarnation, it is on many pizza place’s menu. But homemade cannot be beat and honestly this takes no time at all. Firstly, you need a breadmaker. If you don’t have one, buy one! Breadmakers are essential to any cook’s kitchen. And don’t give me stick about making bread with my own two hands. I have other things to do with those hands, like write books! By the by, in England, they have breadmaker cake mixes. They might have these in America too. These are absolutelybrilliant! You dump the stuff in and a little while later, voila!– cake! And cake in any form is a celebration. Again, I digress. Okay, first dump the chicken breasts into a Tupperware (or Lock and Lock) and dump a load of barbeque sauce on them, squish them around so they are drenched in the sauce, snap the lid on that puppy and put it in the fridge. As with any marinade, the longer you marinade it, the better it is. Now, going backwards from making it and baking it (about 30-40 minutes) from when you wanna eat it, time when you put your breadmix in the breadmaker to make the dough. Whatever that time is according to your breadmakerand the added 30-40 minutes, start your breadmix in the breadmaker. When the dough is done, pull the chicken breasts out of the marinade and slap them on your grill pan (in the UK, a cookie sheet in the US if you don't have a broil pan) and be sure to slop on your barbeque sauce marinade too. Then grill them 5-7 minutes a side ('grilling' for those of you in the US means 'broiling'). Do this on high heat, 220-230 degrees C / around 450 degrees F.
While the chicken is grilling/broiling, take out a baking/cookie sheet and rub some olive oil on it (and make sure you rub it up the sides and around the lip). Don't overcoat it with oil as your dough will shrink back and it'll be a pain in the behind to roll out the dough. Pull the dough out of the breadmaker and slap that mess on your cookie sheet. Marky Mark uses a rolling pin to roll out the dough. I use my fingers. Whatever you do, roll or rub it out on the pan. Dump as much barbeque sauce on the pan as you want. I use a whole bottle but you may want more or less. Spread that around. When your chicken is done grilling, put it on a cutting board and chop it into small sized bits. If you prefer chunks, obviously, since you're eating it, chop into chunks. I like the small sized bits. This will be a lot of chicken but that is why this is better than restaurant pizza, it is packed with barbeque chickeny goodness. Be sure to slop on all the barbeque sauce from the grill pan, chop the chicken in the barbeque yumminess and scoop it up to put on the pizza with the chicken. Get your black olives out and chop those up relatively fine too (or not, your choice). I use a bunch of olives, 10-15. Depends on how olive-y you feel. By the way, set your oven to bake (from grill/broil) and don't change the temperature. Spread the chicken and olives around the pizza base. Sprinkle cheese on top - now here's the good part and one of Mark's not-so-secret-anymore secrets - make sure you get loads of cheese on the edges. Not just the middle, the edges. Slide the pizza in the oven and bake for approximately 20-25 minutes (remember, your oven is set at the same temperature, just set at bake not grill). When you get the pizza out, you will see why you wanted to coat the edges with cheese because they have become a bonus - cheesy bread bits because the ciabatta has risen to become a fluffy, awesome, cheese-encrusted crust! Cut up instantly and eat. Again, a no brainer but super yum! Photos of the process AFTER I got my killer, new, Le Creuset stovetop grill – heavy enough to be an impromptu weapon, say, if someone is wanting to kidnap me and I need to utilise anything at hand to stop that from happening – and totally awesome for grilling an-ee-thing!